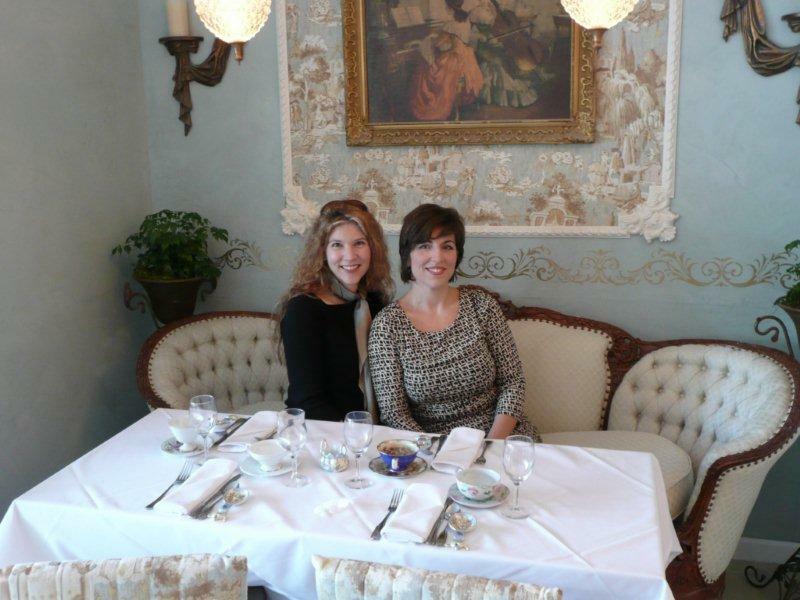 My friend Aimee Pelligrini has mastered the art of creating a comfortable, elegant, and completely relaxing atmosphere at her new restaurant The Tuscan Tea Room and Romanza Floral. 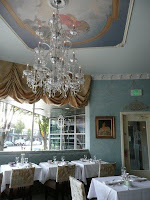 Crisp white linens salute you; a gorgeous crystal chandelier catches the light which is repeated in the sparkling crystal as well as the colorful china tea cups on the tables. 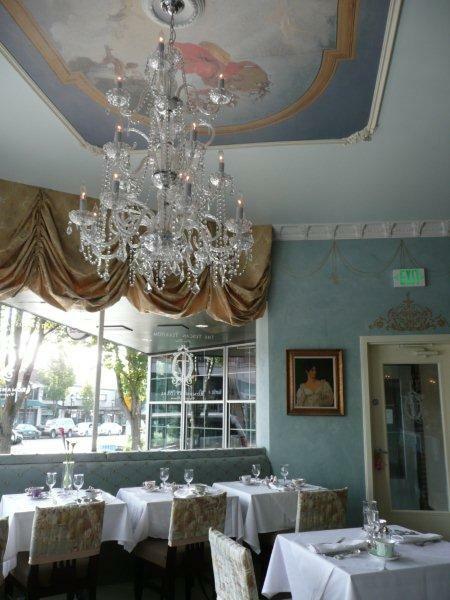 Fabulous artwork draws you in, and elegant classic furnishings comfort you as you contemplate the vast tea menu that includes creative names such as Coco Cabana all the way to Kentucky Derby, and of course several varieties of chocolate tea! I had a hard time deciding between Thin Mint, Chocolate Fireside Chai, and Chocolate Truffle. There was even Pangiallo (black tea, chocolate chips, orange, and a mystery spice from Italy). Oooh such decisions! I ordered the Chocolate Truffle because the chocolate is roasted with the tea. The chocolate tastes more toasted than roasted and blends well with the flavor of the tea to make a light chocolate sipping experience. I added just a touch of sugar and cream after the first few sips. Now we are talking about more than an afternoon pick me up, it was much more like a light chocolate tea truffle. Delicious! Aimee, Thank you for sharing your marvelous talents to create a timeless experience that we can share with you, and thank you, thank you, thank you, for including chocolate in your tea collection. I can hardly wait for a chance to go back and try your home made scones and more chocolate tea…the Pangiallo is next on my list, which will be closely followed by the Chocolate Fireside Chai, then…oh so many choices… I’m beginning to see many tea leaves in my chocolate future. I happened to be across the table from Barbie for this wonderful "event." Sipping tea at Amy's surrounded by the beauty of delicate tea cups and saucers, white tableclothes,aromatic fragrances swirling in the air...remembering the art of being in the moment. An experience I hope you all will seek. I am heading back soon!